​​United Allergy Services exists to empower physicians, and advance the understanding of immunotherapy as the only known disease-modifying treatment for allergies. UAS has a uniquely distributed workforce that is fundamentally embedded within doctors' offices throughout the country. They face all the typical communication and collaboration challenges that modern distributed workforces face. They wanted a portal to serve as an intranet, and they wanted to move quickly and set up within the cloud. They especially wanted to have their messaging and branding so that it would have a minimum of training requirements for their users. 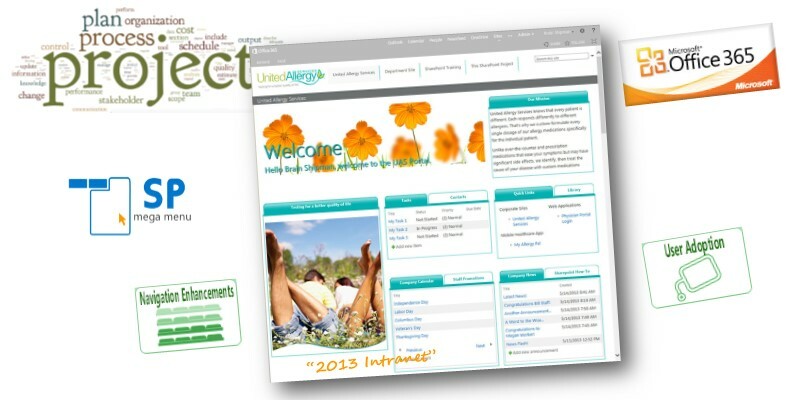 We deployed our QuickStart portal which is essentially a suite of components for an intranet. This was installed in Office 365, and then we turned our attention to some very deliberate digital and experience design for its branding, and knowledge transfer for its new SharePoint admins. It was a tremendous success for communication and collaboration amongst the distributed workforce. It's a solid foundation that will continue to grow over time. We are one of the oldest providers of SharePoint consulting services so contact us today and we can help you get the most out of SharePoint! One of the easiest ways to get to know us is with a SharePoint health check! We can quickly review your current configuration and recommend how to better align SharePoint with your business goals.